On March 15, 2013, the Occupational Safety & Health Administration (OSHA) issued a reminder to employers that the first training deadline for OSHA’s Hazard Communication Standard (HCS) is December 1, 2013. By this date, employers are required to complete training on new label elements and safety data sheets (SDS). OSHA aligned its HCS with the United Nations’ Globally Harmonized System of Classification and Labeling of Chemicals (GHS) to provide a clear and standardized approach to classifying chemicals and communicating their hazards. The new label elements and SDSs provide more simple, understandable contents to help workers better understand chemical risks and precautions. SDSs also include details for first aid, firefighting, and personal protective equipment (PPE), like respiratory protection, safety glasses, protective clothing, and work gloves. "Exposure to hazardous chemicals is one of the most serious threats facing American workers today," said former U.S. Secretary of Labor Hilda Solis. "Revising OSHA's Hazard Communication standard will improve the quality and consistency of hazard information, making it safer for workers to do their jobs and easier for employers to stay competitive." 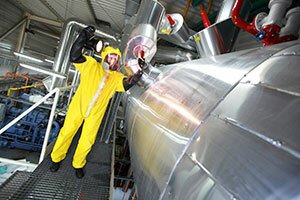 Protect workers exposed to hazardous chemicals by providing training and the appropriate safety equipment.